Bayern Munich showed their class against a young Hibs Ladies side with a comfortable 6-0 win at Easter Road in the Uefa Women's Champions League. Goals from Stefanie Van Der Gragt, Vivianne Miedema and Melanie Leupolz gave Bayern a 3-0 half-time lead. Miedema and Leupolz both scored again before Bayern were awarded two penalties; Melanie Behringer scoring while Nicole Rosler missed. The sides meet again in Germany next Wednesday. Hibs, in the last 32 of the competition for the first time, knew they would be under heavy pressure right from kick-off. They defended in numbers but Van der Gragt was able to break early resistance when she headed in from a corner kick. Van der Gragt headed off the bar a second time, before Miedema twice failed to hit the target from close range. It was two though when Sara Dabritz played a neat ball through to Miedema who finished high into the net. Leupolz headed in at the near post to make it three as the one-way traffic continued. Cheered on by a crowd of 2,551, Hibs tried to venture forward and Lizzie Arnot tested Bayern goalkeeper Tinja-Riikja Korpela from long range. It was Scotland international Lisa Evans who orchestrated Bayern's fourth goal, picking out Miedema for her second goal of the game. 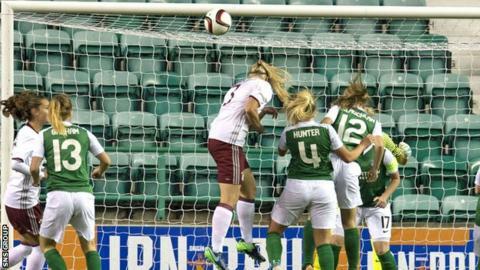 Hibs just could not cope with the height of the Germans and really struggled to deal with crosses, and as the home defence failed to clear their lines Leupolz was able stab home her second and Bayern's fifth. It was soon six when Behringer scored from the penalty spot, sending Jenna Fife the wrong way, and it could have been seven when Rolser won another penalty, but she took it herself and cracked it off the crossbar. It was no embarrassment for Hibs though who came up short against a full-time team packed with internationals, who were quicker and stronger all over the park. Hibernian captain Joelle Murray talking to BBC Alba: "The girls deserve to be on the Champions League stage, so it's about gaining the experience. We knew Bayern would be a top team and they showed that. "We just couldn't live with them down the wings. Four of the the six goals came from crosses or corners." Hibernian: Fife, Willamson, Hunter, Robertson, Arnot, Smith, McLauchlin, Graham, Murray, Cornet, Harrison. Subs: Jeffries, Michie, Heron, Ewens, Notley, Small, Brownlie. Bayern Munich: Korpela, Lewandowski, Van Der Gragt, Behringer, Leupolz, Miedema, Holstad, Evans, Faisst, Schnaderbeck, Dabritz. Subs: Zinsberger, Abbe, Falknor, Wenniger, Maier, Gerhardt, Rolser.